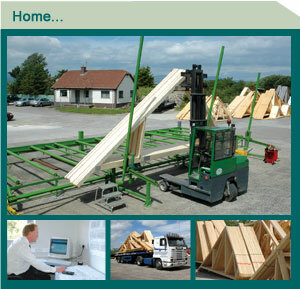 Longfield Roof Truss (NI) Ltd has been manufacturing roof trusses on the Longfield Industrial Estate, Eglinton since 1983. It is one of Ireland’s leading roof truss specialists, achieving this reputation through a skilled workforce using the latest technology. "We offer a reliable service, and a well made product built from the best available materials"
Using computer aided design, the trussed rafter roof structure is designed in-house by our competent staff to the relevant codes of practice and approved by N.S.A.I (National Standards Authority of Ireland).